We met in London last year and discussed one or two things we could do together. With Yes Foundation, we want to set up our own orphanage in Nigeria. We want to take it to everywhere possible especially in Africa . We are soliciting government involvement in all aspects especially in logistics support and funds. We can't do it all alone. We need government participation. So far, so cool, there has been very positive response. Right now, the album has sold every copy. It is very great. It is very deep. The track Jungle Don Mature is a general street slang in Nigeria. It simply means the game has come of age. The game has really grown to maturity. It is a street language. I have involved young and budding acts in my albums out of the love and respect I have for them. Also, as a way of giving back to the industry, what the industry has given me, I have to give back. It is another way of assisting these musicians to climb the ladder of success. 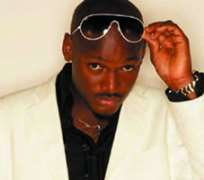 I am happy with the entertainment industry in Nigeria . However, I believe that it can still get better. We seriously need the copyright law to put things in good shape and for protection. The areas of arts management and international law also need to be examined and re-examined for improvement. Piracy is a serious problem in Nigeria. We hope the authorities concern will do something urgently to move against the pirates. This has to be done very fast. I pray that the police and other law enforcement agencies will take serious measures on crimes. They should concentrate more on detection, prevention and intelligence gathering. I have many role models. It will not be fair to start mentioning their names. But if you insist, those I can readily remember include RMD, Bongos Ikwe and Nelson Mandela. Apart from music, I act and write songs. I also produce artistes. I don't know whether I would have been working in a bank, if I am not singing. At age six or seven, I just realized I love music, even at that very early age. My parents were not opposed to it. But they only wanted me to finish school before music. There was no opposition from my family. I have OND in Business Administration and Management. I intend to go back to school, most especially a business or entertainment school. I have been in music all my life but professionally for 11 years. There can't be retirement in this our profession. Every age comes with different ideas and more wisdom.